Draw overlay text on video and custom text color, font size, shadow color. Draw overlay image on video with alpha value. Draw overlay scrolling text on video, scrolling style, custom text color, font size, scrolling position. Draw overlay motion image on video, custom motion style. Programmatically select video device, video format, get the specific video device and video format name and count of video device and video format. Support a lot of Video Effects, Brightntess, Invert, Ripple etc. Include Sliverlight c# 2010 Sample Code. Royalty free distribution of the control files. Compatible with Microsoft Visual Studio 2010 or above products including Visual Studio 2010 Expression Editions as well as Microsoft Expression Blend. added support add overlay text, overlay image, motion image, scrolling text on video. 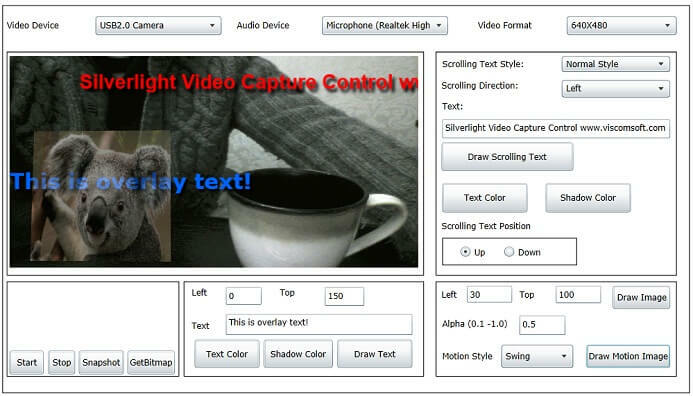 Developer can easily add powerful video capture capability to their browser applications or outside of the browserapplications on desktop. 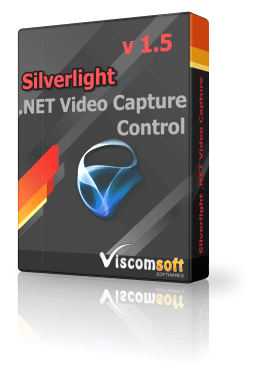 Silverlight Video Capture Control runs in all popular Web browsers, including Microsoft Internet Explorer, Mozilla Firefox, and Apple Safari, Google Chrome, and on Microsoft Windows and Apple Mac OS X.